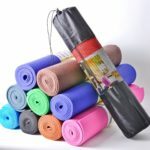 The good news is that you can get started with just a simple mat and a towel, so you can roll them up and take them with you – anywhere! On this page you will find guidance on the things to look out for. 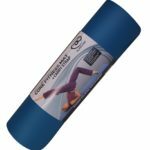 Sometimes called a yoga mat, it needs to be between 140 and 180 cm long and between 50 and 70 cm wide – the taller you are , the bigger mat you will need. The thickness should be at least 6 mm, but you may find that 10 mm makes mat work more comfortable on the bony parts of the body. Avoid mats that are more than 10 mm thick – they quickly become difficult to transport and tend to strain the wrists in all-fours (4-point) positions. Available from £5 to £50 (and beyond) from our friends at Amazon, our top choices are shown below. Generally avoid the cheapest versions, but there are many good choices from £10. Choose a colour, thickness and style to suit your budget and personality. One day, Pilates4Life will have its own range of Pilates-wear (and Pilates will be compulsory on the school curriculum) but in the meantime any stretchy clothing that allows you to move freely will be fine. 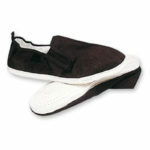 For most of the exercises that involve laying on your back, you will need a support for your head. A small bath towel is great. You will be using it folded up to a thickness of 7.5 cm (3 inches). More convenient than a towel, is a purpose-made Head Cushion that gives just the right amount of support to the head and takes the strain off the neck. Not to be confused with the more solid Yoga block.